Because the everyday electricity source is almost necessity of today's world (mainly due to smartphones) and that usually means a problem during travelling on motorcycle - mainly when camping. For that reason I decided to buy myself some battery pack that could charge my electronic gadgets that I use every day on my motorcycle trips. That means of course my smartphone, GoPro camcorder, helmet intercom and maybe some other in the future. Most of those gadgets are charged with some kind of USB connector (so it can be charged from computer, electricity adaptor or even 12V car power outlet. When riding a motorcycle I do not want any cables hanging on handlebars or to my pockets, or even having a cell phone in topcase or something. For that reason I decided to buy a battery pack that would charge from 12V power outlet when riding (I have to work on this circuit with some relay that will switch on when I start the engine) and when I reach my destination or during the night it can charge what I need. The best price/performance ratio seemed the Samsung Battery Pack with 9000mAh (the capacity is for 3,8V internal battery - but don't worry the output has standard USB with 5V and something between 1-2A) - that means capacity of 34Wh. Which should be enough for charging my cellphone 4-5 times! It costs here in Czech Republic about 50 Euros (that's about 60 USD). It is charged through USB mini connector (the producer claims that it can be charged with current up to 2A and voltage of 5V which means really fast charging). And it can charge your devices through standard USB female connector so you can use enclosed short micro USB cable or some special cable for some of your devices. 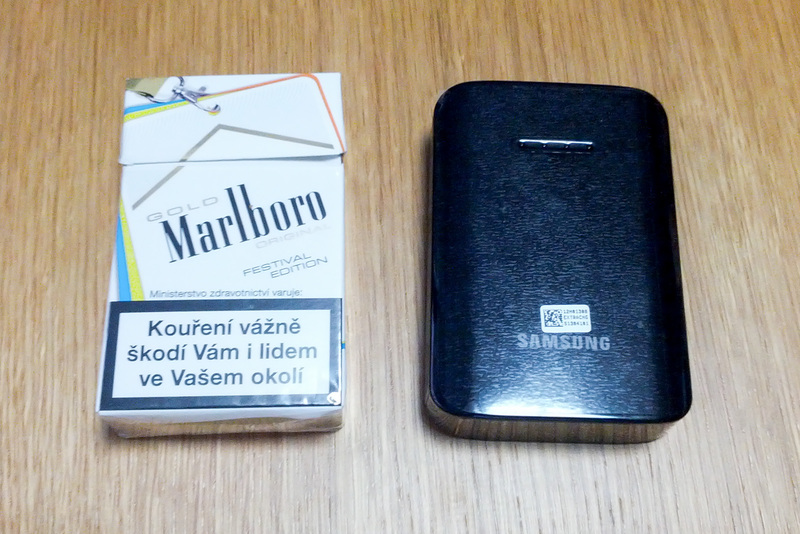 The dimmensions of the battery pack are similar to the pack of cigarettes. 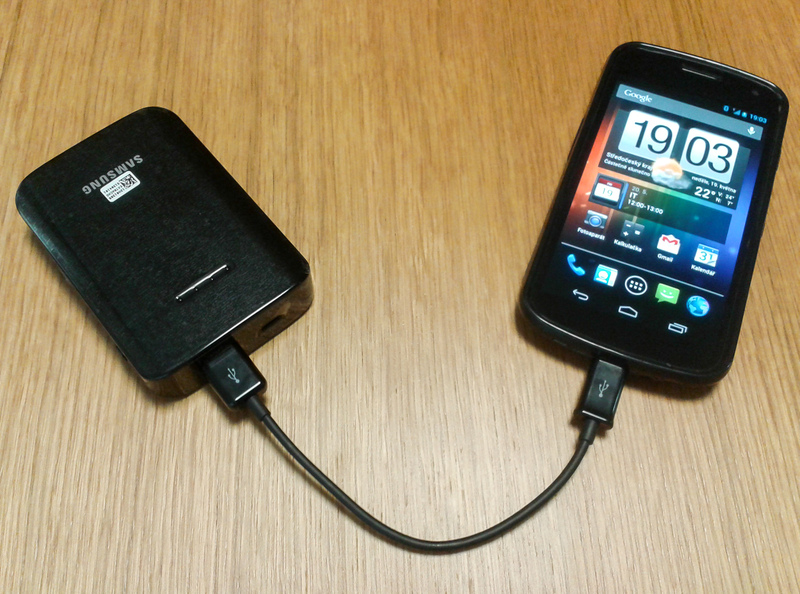 Short test: The battery pack was charged during the night with standard (I believe some old OEM Nokia) charger. In the morning the battery pack was used to charge one smartphone (Samsung Galaxy S3 mini). It was charged from 19% to 100% in 2 hours, 5 minutes (which is very similar to standard charging time when normal charger is used). Then there was a pause for two or three hours and another smartphone (Samsung Galaxy Nexus) was charged from 20% to 100% in 2 hours and 15minutes (again very similar to OEM charger). After that test the Battery Pack indicated still 3 of 4 LEDs so I believe that it was somewhere on the edge of 1/2 and 3/4 of its capacity. So really great result. So I managed to charge 4 smartphones without any problems. What to say as a conclusion? Great product with great reputation of manufacturer and what's more: for great price.